Want to visit Cuba for the 60th anniversary of the Revolution? Now is your chance! Book today. This popular tour includes visits to Cuban trade union organisations, with associated professional visits to workplaces, schools and local health care centres. 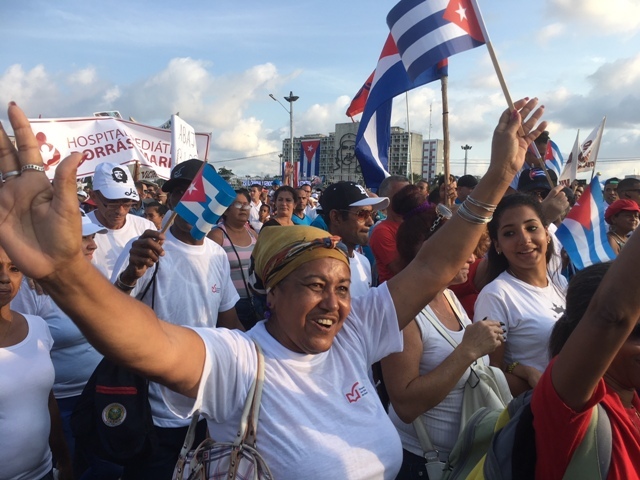 The itinerary includes a special invitation to attend the inspirational May Day Rally in Plaza de la Revolución in Havana, joining over 1 million Cubans to mark this special day in the Cuban political calendar. Group members can also take part in the International Solidarity Conference, sharing ideas and values with our Cuban hosts and other participants from around the world. The trip will include a 6 night visit to Pinar del Río Province, with visits to examine rural health and educational services and a unique visit to an agricultural coop in the fascinating landscapes of Viñales. £1,846 per person including flights based on sharing twin room / £135 single room supplement. Contact us TODAY tours@cuba-solidarity.org.uk or phone 020 7490 5715 for more information.